Rabbits as Pets are one of the best pets for children. Rabbits require little care, feeding, grooming, bedding change, and a clean rabbit cage all tasks that a small child under supervision can accomplish. This will Build their confidence and sense of responsibility. Rabbits require a simple cage, eat a varied diet and become quite attached to there owners often following them around. 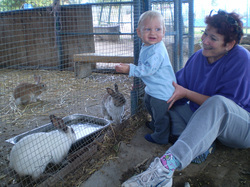 There are numerous rabbit clubs that can be joined, increasing the child's interest in their pet. Another small pet that is often associated with the rabbit is the Guinea Pig Requiring the same ammount of care, with very similar eating habits. One major difference is that Guinea pigs do make a noise unlike rabbits who are very quiet animals. The sound is somewhere between a squeak and a whistle, but not very loud, so no complaints from the neighbours. Not as sociable as rabbits but friendly enough if handled with care. A pet rat is another animal to consider for older children, rats love attention and become very attached to their owners. It is important not to startle any animals that have a nervous temperament, as their first reaction is to run, their second reaction is to bite if they find themselves in a closed environment, such as a hutch with no means of escape. 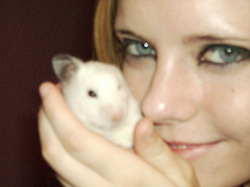 Hamsters, Rats, Gerbils & Mice! Not everybody's favorite choice of pet. I have an Aunt who jumped onto a dinning room table at the sight of a mouse, bearing in mind that she was eight months pregnant at the time, this did not prevent her from achieving this Olympian feat. If you ask anyone who has one of these as a pet they will tell you they are among the most intelligent animals that you could meet. Hamsters rats gerbils and mice have similar characteristics, they love investigating new things, curious, very active especially at night, sleep soundly, and become very close to their handlers.